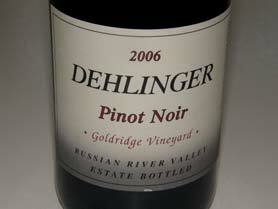 Don’t forget the 2006 vintage California Pinot Noir, many of which are still readily available in the marketplace. 14.7% alc., 650 cases, $36. Athair means “father” in Irish Gaelic. Winemaker Jim McMahon crafts this wine dedicated to the fathers in his life. Sourced from three vineyards. 3-day cold soak, 8-day fermentation, aged in 25% new French oak barrels for 9 months, held in bottle for an additional 5 months before release. · Captivating aromas of cherries, sassafras, sandalwood, sage and oak. 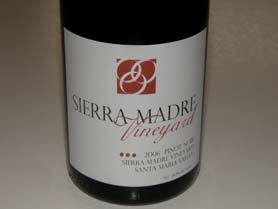 Ripe cherry and raspberry core with underlying hints of herbs and forest floor. The mouth-coating ripe tannins need some time to resolve. A very flavorful wine that is immensely satisfying. Decant now if you pop the cork and match with short ribs. 14.5% alc., $40. · Fairly garnet color. 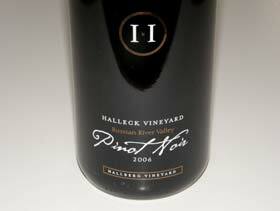 A light and elegantly styled Pinot Noir that has some charming ripe cherry and berry fruit aromas and flavors with underlying dark caramel notes from oak and a juicy grip of citric peel on the bright finish. Harmonious with ripe, dry tannins and alluring finesse. 14.2% alc., 483 cases, $30. · Vivid black cherry aromas with faint smoke in the background. Slightly confected cherry and cranberry flavors with a little oak on the edge. A very smooth texture, gossamer tannins and bright acidity on the finish make for easy drinking. 14.8% alc., $45. · Aromas of slightly oaked cherries and wet earth. Tasty sweet cherry and cranberry fruit that is modest in weight. Soft tannins with appealing restraint and a grip of acidity on the finish. True to the Dehlinger style marked by finesse. Dierberg farms two cool climate estate vineyards: the 160-acre Dierberg Estate Vineyard just outside the town of Santa Maria with about two-thirds of the vineyard planted to Pinot Noir and the newer 70-acre Drum Canyon Vineyard in the Santa Rita Hills planted to Pinot Noir. Jim and Mary Dierberg also own the 230-acre Star Lane Ranch, a warmer vineyard site planted to warm-climate varieties in a valley not far from Santa Barbara. A new winery has been carved into the sandstone of a 1,500-foot-high ridge above Star Lane Vineyard. Nick de Luca is the winemaker for both Star Lane and Dierberg Vineyards. His background includes winemaking tours at Williams Selyem, Fisher, and Byington. Rodolfo Bravo is the vineyard manager for the vineyards. The Dierberg Estate Vineyard is planted in soil with a higher loam content tending to produce Pinot Noirs that are more savory in flavor and powerful in structure. The clones consist of multiple Burgundian clones and unusual California selections. 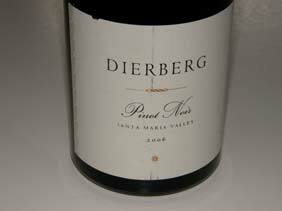 Winemaking for the 2006 Dierberg Pinot Noir featured severe hand sorting, some stem inclusion, natural yeast fermentations, aging in 75% new French oak for 17 months, light fining with egg whites and bottling without filtration. 14.9% alc., $42. The Dierberg Vineyard is located 14 miles from the Pacific coast at the southern end of the Santa Maria Valley. Dierberg is a family owned winery founded in 2001 producing hand-crafted wines from estate vineyards in the Santa Maria Valley and Santa Rita Hills. Vineyard yields were down 35% in this vintage. · A stunning nose composed of aromas of perfectly ripe cherries and berries with subtle hints of baking spice and smoke-infused oak. A really impressive mouth full of delicious dark sappy fruit underlain with smoky oak, earthiness and citrus. Seamless with perfect integration of alcohol and harmonious t n’ a portending a long future. The wine is more elegantly styled than usual from this vineyard. The best I have ever tasted from this producer and a memorable wine. 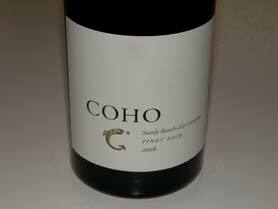 14.9% alc., 295 cases, $55.From a vineyard located in Sebastopol that was formerly an apple orchard. · Lovely perfume of slightly confected black cherries, oak toast, and mocha java. 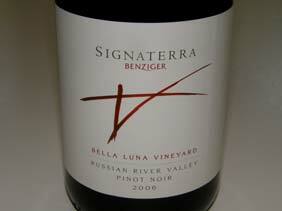 Soft in the mouth with generous berry and cherry fruit. Fruit-driven flavors are primary with some earthiness in background. Plenty of acidity adds a lively tone. 14.5% alc., 225 cases, $90. The most exceptional nine barrels in the cellar. Clones are 115, 667, 777, 23 and Pommard. All free-run juice and aged for 9 months in 45% new French oak. 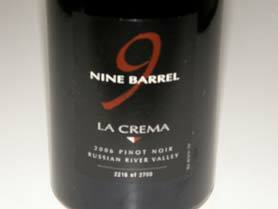 The Nine Barrel blend is layered and then racked to one-year-old French oak barrels for an additional 5 months of aging. · Deep ruby color. Ever changing aromas of Bing cherries, cherry cola, Asian spice, and oak vanillin. Rich dark blackberry fruit that is intense but not jammy. Oak plays a light supporting role. Plenty of lively acid and ripe tannins to balance the prodigious fruit. Beautifully crafted with perfect harmony. A very good wine but doesn’t yet quite deliver the emotion one expects from such an expensive wine. Cellar for at least a year or two. 14.4% alc., 283 cases, $42. Sourced from two vineyards. Clones are 23 and Martini. Aged 16 months in 55% new French oak. · The nose stars Bing cherries with side notes of Provencal herbs, sage and oak. Crunchy dark cherries, and ripe strawberries with an underpinning of forest floor, savory herbs and a citrus note on the brisk finish. The dry tannins are well corralled. The mid-palate fruit attack lacks some fullness, but this is a very pleasant drink. 14.9% alc., 1,772 cases, $40. Winery owners Doug and Jan Circle source grapes for their wines from their own Sierra Madre Vineyard. The vineyard, which was planted in 1971, was purchased from Michael Mondavi in 2003. The winemaker is Steve Rasmussen. Clones were vinified separately. Aged in 35% new French oak barrels. · Deep reddish-violet color. The plentiful oak overwhelms the ripe cherry fruit on the nose. Prodigious fruit with touches of cola, herbs and oak. Soft and smooth with a mouth filling presence and admirable acidity. The oak takes over in the glass over time. 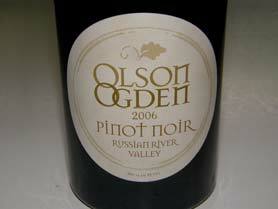 A man’s Pinot Noir that will appeal especially to oak lovers.